Mohamed Assani is a celebrated sitar player known for being a proactive ambassador for his rich musical tradition. 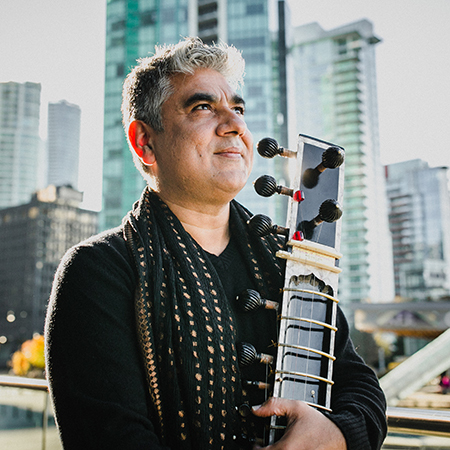 Throughout his extensive career, he has brought the sitar to new audiences through innovative collaborations that have stretched the boundaries of his instrument. He has performed Hindustani classical music as well as his own original music across the globe — with orchestras, hip hop artists, world music ensembles, jazz artists, Indian & Pakistani classical artists — and as a soloist. Mohamed has been invited to present his music to royalty and heads of state, including the Governor General of Canada, Royal Family of Dubai and HRH Prince Karim Aga Khan. Mohamed is a leader in his field – forging new paths for his music to develop and grow, while remaining committed to the rich depths and roots from which his tradition has emerged. He is based in Vancouver, Canada.